Sweet Home in St. Peters! Professionally landscaped front yard & Vinyl sided home w/ an oversized two car garage and newer garage dr. Open the storm dr to the entry foyer and be swept away by the freshly painted interior with spacious beauty and open floor plan. Exceptional laminate flring on Vaulted main floor including the hall way and bedrooms. Home has Full updated hall bath with double sink, as well. Kitchen w/ ceramic tile flring & new dishwasher allows for tons of cabinetry to whip up those evening meals. Main floor is brightly illuminated with windows and a sliding dr exiting the breakfast area to the deck and huge fenced yard. Large Master bedrm allows for big bedroom furniture. 2 other well sized children’s bedrms. Finished LL to watch those weekend Hockey games! With an additional full updated bath. 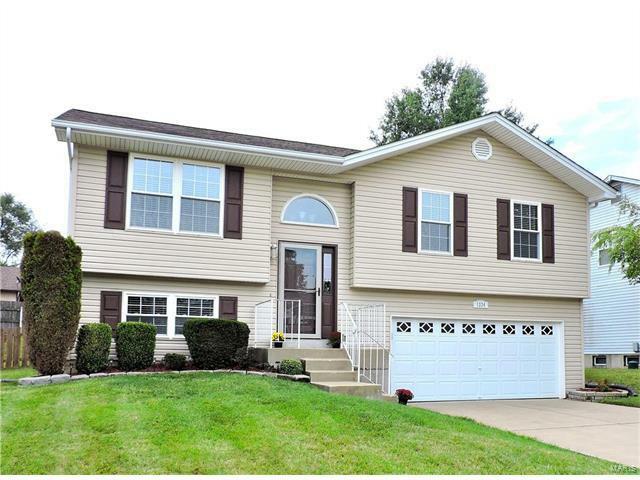 Newer: Garage door & opener,Front dr & Storm Dr & Shutters,Updated Master Bath,Laminate flring & Baseboard,Roof, Dishwasher,Painted interior.